Located in Downtown Minneapolis, this historic property is within a 15-minute walk of Minneapolis Institute of Arts and Walker Art Center. Minneapolis Convention Center and Nicollet Mall are also within 1 mi (2 km). Nicollet Mall Station is 29 minutes by foot and Warehouse - Hennepin Station is 30 minutes. Large & Great for Families Near Downtown! Situated in Minneapolis, this property is within 1 mi (2 km) of Abbott Northwestern Hospital and Minneapolis Institute of Arts. U.S. Bank Stadium and Minneapolis Convention Center are also within 2 mi (3 km). Franklin Station is 28 minutes by foot and Lake Street - Midtown Station is 29 minutes. Charming, Spacious & Close to Uptown and Downtown! Situated in Minneapolis, this property is within 1 mi (2 km) of Abbott Northwestern Hospital and Minneapolis Institute of Arts. U.S. Bank Stadium and Minneapolis Convention Center are also within 2 mi (3 km). Franklin Station is 28 minutes by foot and Lake Street - Midtown Station is 30 minutes. This family-friendly property is located in the city center, within 1 mi (2 km) of Minneapolis Sculpture Garden, Minneapolis Convention Center, and Walker Art Center. Minneapolis Institute of Arts and Nicollet Mall are also within 1 mi (2 km). Nicollet Mall Station is 29 minutes by foot and Warehouse - Hennepin Station is 30 minutes. Wake up, stretch, and pad across the bedroom to your kitchen. You’ve got a busy day of exploring ahead, and you’ll face it best with a mug of piping hot coffee in your hand. Look out the window at the rising sun and take a deep breath. This can be your life if you rent a villa in Minneapolis. Once upon a time, villas were huge Roman buildings owned by the wealthiest citizens. These days, you can still find palatial villas—but there’s smaller, cozier options to choose from as well. What makes villas so special? First, they offer you and your travel group privacy and space. After a long day of exploring Minneapolis, a villa truly becomes your home away from home. Lay down in one of the bedrooms for a midday catnap, then make use of the fully stocked kitchen and craft a culinary masterpiece to serve up on the private patio. Your companions will be talking about it for years to come. 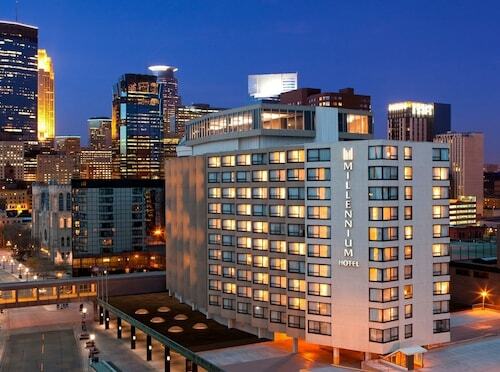 Do you want to really treat yourself during your time in Minneapolis? Go for it. Luxury villas will make you feel like a million bucks as you sip champagne on a balcony, or cozy up with your someone special and take in the classy artwork. Put that big marble tub to good use. The more fragrant bath salts, the merrier! At Travelocity, we offer the vacation villa options you want, with a number of villas available for rent in Minneapolis. Get the most out of your time in this fascinating city, wise wanderer, and browse our available villas today.